This naming of a new species was generally dismissed; many paleoanthropologists thought it premature to name a new species on the basis of a single incomplete mandible. In 1985, when Alan Walker and Richard Leakey discovered the famous "black skull" west of Lake Turkana in Kenya, the classification remerged. With its mixture of derived and primitive traits, KNM WT 17000 validated, in the eyes of many researchers, the recognition of a new "robust" species dating to at least 2.5 million years ago in eastern Africa. 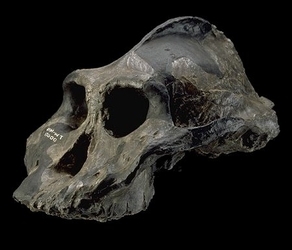 The issue was debated, but today there is general consensus that there was a distinct robust species, Paranthropus aethiopicus, living in eastern Africa 2.5 million years ago. The exact phylogeny of P. aethiopicus is still not fully understood. It is thought to have descended from the earlier A. afarensis, and to be ancestor to P. boisei.